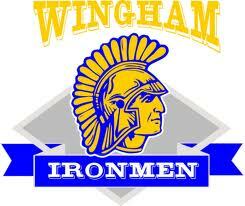 The Wingham Ironmen continued their Pollock Division dominance in October, and it showed on the monthly awards list. Ironmen Captain and forward Jamie Huber was named MVP for October, posting 10 goals and 10 assists in just 9 games. Huber now has 11 goals and 13 assists for 24 points on the year. Also, for a second straight month, defenseman Carter Collinson was named Defensman of the Month, after he lead all defenders in scoring with 5 goals and 11 assists. Collinson now has a total of 6 goals and a whopping 22 helpers for 28 points, with 16 points on the power play. Maybe even more impressive though, from a team perspective, is the fact that a Wingham goalie was named Goalie of the Month for a second time, but this time it’s their other netminder getting the nod. Devon Carson won the award for September, and now Jamie Brock gets his moment in the spotlight after winning all 5 of his starts last month. Wingham has a two-headed monster in the blue paint right now, and Brock now has a stat line that is eye-popping; a record of 7-0-0-1 (one tie), a 2.46 GAA and a .917 save percentage, allowing just 20 goals and making 222 stops thus far.